Know A Boy Who Loves to Sing? Join us for Boychoir Bootcamp! 6:00 pm performance on Friday, July 26. Boychoir Bootcamp is a week-long day camp for boys who love to sing. While focusing on choral singing, campers also participate in activities such as body percussion, music theory, drumming, and the science of sound, as well as plenty of outdoor fun and games. Boychoir Bootcamp is held at Saint Paul's Concordia University, which offers spacious rehearsal rooms, comfortable activity spaces and a lovely auditorium where our final performance will take place. On Friday, July 26, campers will perform an end-of-camp concert for family and friends. 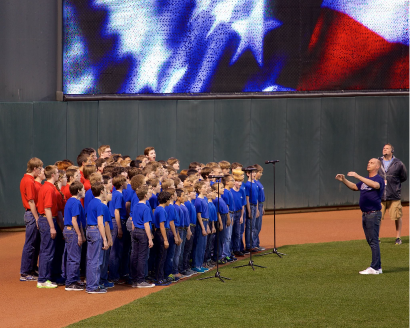 Afterwards campers will sing the national anthem for the Saint Paul Saints game at 7:00pm. Each camper and one parent or guardian will receive a ticket to the game. No prior singing or music experience is necessary! If they love to sing, they will love Boychoir Bootcamp! Boychoir Bootcamp is open to boys ages 6-11. Camp runs one week, Monday through Friday, from 8:30 a.m. to 4:30 p.m. The camp culminates in a performance for friends and families on Friday afternoon and singing the national anthem for the St. Paul Saints game. To ensure this opportunity is available to all children, scholarships are available. Questions about Boychoir Bootcamp can be sent to Todd Price.